It's 2014. Everything needs an app, and HubSpot's 5th Annual Charity Auction was no exception. Until this year, our silent auction worked the traditional way: people writing their bids on pieces of paper, walking away, and maybe coming back every once in a while to see if anyone had outbid them. Does this work? Sure. Would it be way cooler (and more fun) to let people bid with a mobile app? Definitely! As it turns out, this isn't a new idea. 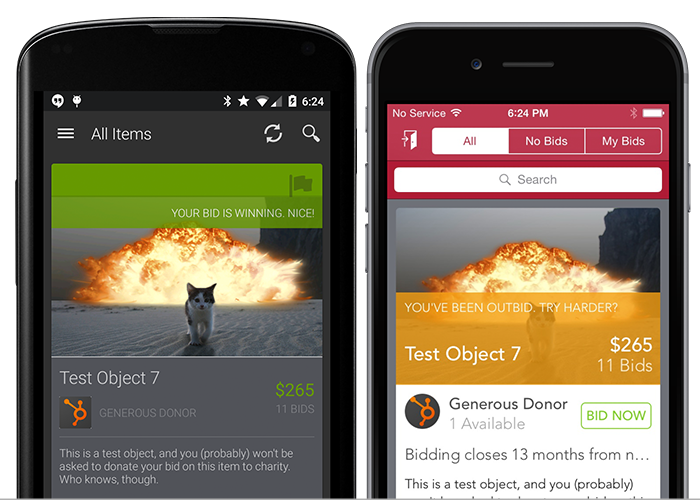 A number of silent auction apps already exist, and our auction organizers looked into them. A recurring issue with each solution was that they cost hundreds to thousands of dollars. When you're raising sums in the tens-of-thousands range, that's a substantial loss. And despite the cost, most of the "apps" were either mobile websites, or native apps that simply wrapped the mobile website. Either way, the user experience suffered.